The world of payment processing can be a confusing place to map out—a fact exacerbated by naming conventions. There are card companies, which don’t (generally) issue the cards, that process and facilitate transactions among all the other players. There are processors, which provide services to merchants and might move money between banks. There are banks that work with merchants, and banks that work with consumers by issuing credit cards and credit. And then there are certain players that do a bit of everything. Over the last decade, many large players have moved full-stack. In fact, an average credit card transaction involves some half a dozen players as it goes from consumer to merchant to gateway to processor to network to issuing bank and merchant bank, and back again. Card networks Visa, MasterCard, American Express, and Discover sit at the center of the payment industry, facilitating transactions among consumers, merchants, processors, and banks. These companies supply the electronic networks that allow all the players to communicate and process transactions. For their trouble, they charge fees to the financial institutions involved in transactions based on total transaction volume (rather than on a per-transaction basis). That’s why some people liken their function to the payments industry’s tollbooth. 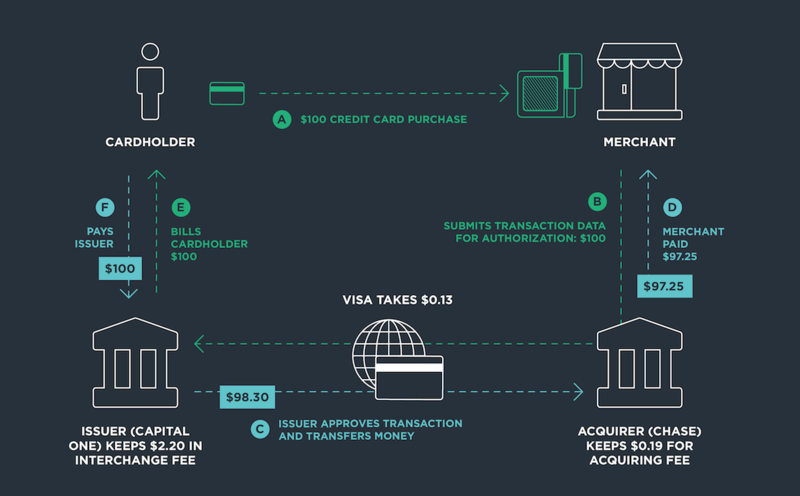 Card networks—for simplicity in this explanation, let’s say Visa—receive fees from the issuing and acquiring financial institutions. Visa makes money by collecting a small percentage (0.13 percent as of early 2015) of total transaction volume, rather than by charging a fee on each transaction. But it also sets and doles out the rest of the fee paid by the merchant to the other players. While this percentage may seem nominal, billions of transactions processed each year (with minimal overhead) add up to a very profitable industry. What’s more, a network like Visa’s entrenched partnerships and critical technologies create high barriers to entry for new players. Established card networks also have low marginal costs to continue operating, making them attractive business models. The business models of American Express and Discover differ from Visa and MasterCard: They consolidate the functions of the merchant bank, card issuer, and card network by personally extending credit and cards, so that fewer parties are involved in their transactions. Card issuers are financial institutions that provide card network payment cards to consumers. So, for example, Capital One might issue a Visa card. These institutions also issue payment to the merchant bank (also called the acquiring bank) on behalf of its customers, the buyers in any given transaction. On each transaction, the card issuer—let’s say Capital One—receives an interchange fee from the merchant acquirer, like Chase Paymentech, Wells Fargo, or First Data, which work directly with the merchant. The interchange fee is set by the card network, and the amount tends to be highly variable, based on a combination of factors such as card type, transaction type, merchant type, and level of risk for the given transaction. In order for merchants to accept payments, they have to work with financial institutions. In the payments world, these institutions are referred to as merchant acquirers. These come in a few different forms: Either payment processors or Independent Sales Organizations. Processors are technological systems that work with banks and card networks to help merchants accept and process credit, debit, and prepaid payments. They verify transaction details, ensure funds are available, and perform certain anti-fraud measures. Processors may be associated with banks, like Chase or Bank of America, or they can be independent, like First Data and Vantiv (which spun out of American Express and Fifth Third Bank, respectively). They're distinguished by their technical ability to carry out transactions. To add to the complications, processors sometimes use ISOs to sell their services, despite their competitive nature. Certain processors, like Vantiv, also work with financial institutions to integrate other services. For merchant services, revenue is driven by the number of transactions and the dollar amount of sales volume. Fees may be based on the merchant discount rate, which is a percentage of the sale amount, or be a fixed fee per transaction. Financial institution service fees are either fixed per transaction or volume-driven based on value-added services, according to Vantiv data. Independent Sales Organizations (ISOs) act as intermediaries between merchants and their banks, essentially reselling the services of processors. In some cases, they might actually be banks: For example, Wells Fargo is a First Data ISO. As payment gateways, they ensure the secure transfer of the transaction data. They also service merchant bank accounts and might create the relationship between a merchant and bank in the first place. For example, Square offers its merchants a merchant acquirer relationship with Chase Paymentech. ISOs also lease point-of-sale terminals to merchants and may service customers who have problems with their cards. Because an ISO is not a bank, it does not physically manage merchants' money and is also not regulated in the same way. This is part of the reason why much of the innovation in the payments space has been around ISOs. Traditional ISOs, which provide point-of-sale technology to offline merchants, include Verifone and NCR . But there are plenty of newer entrants, like Braintree, Stripe, and Square. ISOs make money in a number of ways—similar to the number of functions they perform. Their fees also vary, depending on the contracts they have. ISOs are paid the remainder of the merchant discount after the card issuer, network, and merchant acquirers get theirs. So, for example, Square would get a cut after Capital One, Visa, and Chase Paymentech all get paid after a transaction. On certain transactions, ISOs actually lose money. These losses tend to be offset, though, when they're able to charge the same fee for purchases made with debit cards (which have very low interchange fees) or when they make money on other services. Let’s say a merchant uses an ISO/payment gateway like Square, whose advertised pricing is 2.75%. On a $100 transaction, that means merchant would take home $97.25. The fee paid by the merchant (also called a merchant discount) to have the transaction processed would be $2.75. The majority of the $2.75 fee goes to the card issuer, that is, the customer’s bank. For example, there might be an interchange fee of 2.10% + $0.10, or $2.20 in this case, which is levied and set by Visa, the card network, but paid to Capital One. The merchant acquirer, for example Chase Paymentech, might charge an “interchange plus” rate of 0.13% + $0.06. That $0.19 would then go to Chase, which is acting as both the processor and merchant bank. The remainder would go Square, the ISO, based on its pricing agreement with the merchant.